It would have been better if the magnitude of the magnetic induction at the axis was asked for since the words along the axis usually means directed along the axis. [The component of field directed along the axis is zero]. Forget about it. The question setter requires you to calculate the magnetic flux density at points on the axis (of the semicircular ring shaped cross section of the infinitely long wire). In the adjoining figure we have shown the cross section (of the given wire) lying in the XY plane. The length of the wire is along the Z-axis and the current in the wire is supposed to flow along the negative Z-direction. The broad infinitely long wire can be imagined to be made of a large number of infinitely long straight wire strips, each of small width dℓ. 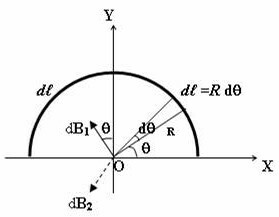 With reference to the figure, we have dℓ = Rdθ. The magnetic flux density due to the above strip is shown as dB1 in the figure. It has an X-component dB1 sinθ and a Y-component dB1cosθ. When we consider a similar strip of the same with dℓ located symmetrically with respect to the Y-axis, we obtain a contribution dB2 to the flux density. The flux density dB2 has the same magnitude as dB1. It has X-component dB2 sinθ and Y-component dB2cosθ. The X-components of dB1 and dB1 are of the same magnitude and direction and they add up. But the Y-components of dB1 and dB1 are in opposite directions and have the same magnitude. Therefore they get canceled. The entire conductor therefore produces a resultant magnetic field along the negative X-direction. 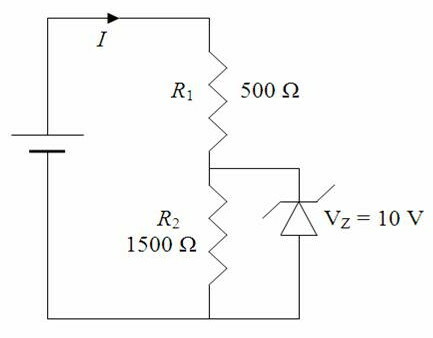 Since the zener breakdown voltage (across the zener diode) is 10 V, the voltage across the resistor R2 is 10 V. The current through R2 is 10 V/1500 Ω = 0.00667 A = 6.67 mA. The voltage drop across R1 is 15 V – 10 V = 5 V.
The above current gets divided between the resistor R2 and the zener diode. Therefore, the current through the zener diode is 10 mA – 6.67 mA = 3.33 mA. By clicking on the label ‘zener diode’ below this post you can access similar questions on zener diodes posted on this site.